This morning, the market seems to be awaiting fresh developments on the U.S.-China trade front as negotiators continue meeting in Washington and President Trump is scheduled to meet with Chinese Vice Premier Liu He later in the day. (Thursday Market Open) Even when the trade winds are generally strong, there can sometimes be lulls. This morning, the market seems to be awaiting fresh developments on the U.S.-China trade front as negotiators continue meeting in Washington and President Donald Trump is scheduled to meet with Chinese Vice Premier Liu He later in the day. Hopes that the two sides can strike a deal to end a months-long trade war that has sparked worries about global economic growth have helped lift markets this year. The main U.S. indices managed to eke out gains on Wednesday, continuing April’s strong run so far. Optimism about a potential U.S.-China trade deal helped lift shares of chipmakers Wednesday, whose revenue streams are tied to China, and the tech-heavy Nasdaq (COMP) outperformed the Dow Jones Industrial Average ($DJI) and the S&P 500 (SPX). The SPX continued ticking toward its all-time closing high of 2,930.75. Later today, several Fed speakers are scheduled to speak at separate events. A pivot to a more dovish policy has helped send stocks up this year. In corporate news, Tesla’s (TSLA) shares were down more than 10% in premarket trading after the automaker disappointed investors by reporting a bigger-than-expected drop in auto sales. The roughly 63,000 deliveries fell short of what analysts had been expecting. Office Depot (OPD) shares were also taking a beating, down more than 15% in pre-market trade, after it warned its Q1 results will likely fall short estimates. In U.S. economic news, jobless claims fell to their lowest level since 1969, according to the latest Labor Department numbers. In the seven days ended March 30, jobless claims, which are a rough gauge of layoffs, fell by 10,000 to about 202,000, the third consecutive decline. Meanwhile, overseas data showed that Germany’s industrial orders fell in February, extending the specter of slowing global growth that investors have been fretting about. While market participants seemed optimistic about a trade deal getting done, they were also delivered a sobering assessment from the International Monetary Fund of what might happen if the world’s two largest economies can’t hammer out a deal and tariffs on all goods traded between the two nations were at 25%. Over the long term, there would be “sizable” manufacturing capacity shifts away from China and the U.S. in favor of Mexico, Canada, and east Asia, the IMF said. And U.S. real gross domestic product would decline between 0.3%-0.6% while China’s would fall between 0.5%-1.5%, the IMF said. Worries like this about global economic growth getting crimped by the trade war have hung over the world’s markets for months, so it’s probably little surprise that investors cheer news like a Financial Times report that quoted Myron Brilliant, executive vice president for international affairs at the U.S. Chamber of Commerce, that a deal is 90% done. That helped lift the market Wednesday. An index that showed gains in China’s private sector also appeared to help sentiment Wednesday, coming on the heels of solid manufacturing data from the Asian nation as well as the United States, which helped boost stocks at the beginning of the week. The excitement over a potential trade deal ended up having to contend with some not-so-great economic news. But there were some factors that kept the economic data from being too much of a weight on the market, and the trade news ended up winning the day. A private payrolls report from ADP and Moody’s Analytics showed an increase of just 129,000 jobs in March, well below a Briefing.com consensus estimate of 178,000. But an upward revision of the prior month’s number helped cushion the blow. The report came two days ahead of Friday’s government report on non-farm payrolls, which, according to a Briefing.com consensus, is expected to show a gain of 170,000 overall and an increase in non-farm private payrolls of 160,000. 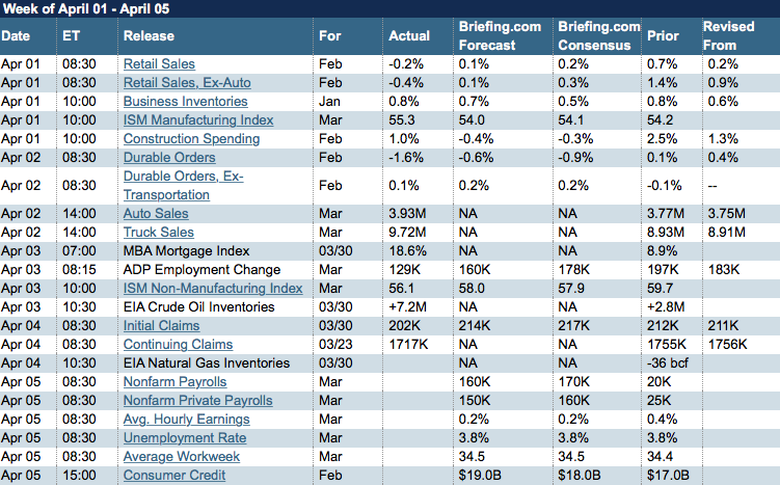 Meanwhile, on Wednesday, a measure of the U.S. service sector also came in below expectations. The Institute for Supply Management’s non-manufacturing index fell to 56.1% from 59.7% in February. A Briefing.com consensus had expected a smaller decline. But a reading above 50% indicates the non-manufacturing sector is generally expanding, and the March reading was the 110th consecutive month of expansion. The growth was just at a slower pace. Another potential headwind as the SPX approaches its record is expectations for a lackluster earnings season, which starts ramping up in earnest later this month. With low earnings expectations, and after executive guidance has tended to be negative, investors and traders may be apprehensive about being too aggressive without a clear catalyst in the form of a deal with China or clarity on Brexit. They may also be looking to keep some powder dry ahead of Friday’s important non-farm payrolls data. Some of that trepidation may be coming through in the Cboe Volatility Index (VIX). Wall Street’s main fear gauge rose Wednesday despite gains in equities. The two often move inversely. Still, the VIX is below 14, and remains at levels considered low by historical standards. Figure 1: The PHLX Semiconductor Index surged Wednesday, hitting a record high amid optimism about a trade deal with China. Semiconductor companies derive much of their revenue in connection with the Asian nation. 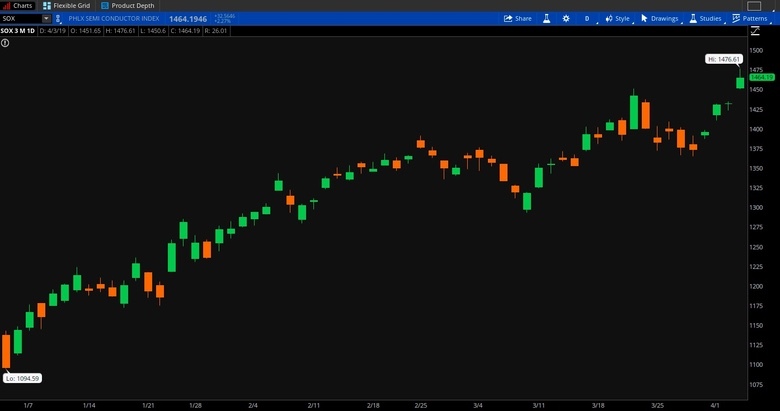 Data Source: Nasdaq Chart source: Thethinkorswim® platform from TD Ameritrade. For illustrative purposes only. Past performance does not guarantee future results. Wages Expected to Rise: Even as oil prices are on the rise, so are wages. The labor market has been tight for some time, and employers have had to boost compensation to attract workers. So far, this hasn’t caused overall inflation to become problematic. In fact, the Fed has turned dovish as it points to muted inflationary pressures. But at some point, rising wages could help boost inflation to a level where the Fed would have to turn more hawkish to keep the economy from overheating. Even before that, however, rising wage and energy “costs threaten to push down corporate profitability, some investors say, creating another hurdle for the stock market just as a slowdown in the European and Chinese economies is chipping away at U.S. growth,” the Wall Street Journal article said. We’ll get the government’s latest official reading on wages in the jobs report Friday morning. A Briefing.com consensus forecasts average hourly earnings to have risen by 0.2% in March after gaining 0.4% the prior month. Inversions and Recessions: There’s been plenty of hubbub among Wall Street hand-wringers in recent days about the inversion of the yield curve as the yield as the 10-year Treasury dipped below that of the three-month because of its correlation with past recessions. But one school of thought says the inversion, which has since gone away, just means the economy is in need of rate cutting action by the Fed. While it’s true that every recession over the past four decades has been preceded by an inversion, investment research firm CFRA reminds us that “an inverted yield curve has not proven to be a guaranteed death knell for the economy or market.” Monthly data since 1980 show seven times when the 10-year/2-year Treasury curve was essentially flat to inverted, but recessions only followed four of those times, CFRA said.